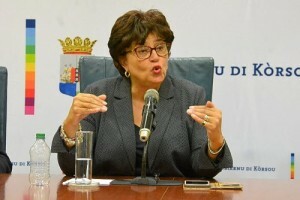 WILLEMSTAD - The Minister of Public Health, Nature and Environment Suzanne Camelia-Römer announced that the meeting about the progress of the construction of the new hospital in Otrabanda has been postponed. The Minister was supposed to explain to Parliament the current situation regarding the construction and the new developments with the contractor Ballast Nedam. Ballast Nedam has placed a lien of 31 million dollars on the financial institution SONA with the government of Curaçao as a liable party. There have been problems for a while between SONA, Ballast Nedam and the Minister. Camelia-Römer, for instance, said earlier that she will take SONA to court to demand openness; she wants to know what the financial institution is spending on what. According to Ballast Nedam, SONA is not complying with its financial obligations. This is bringing the progress of the project in danger. The hospital must be finished by August this year for the transition process to start.